With the popularization of Samsung 4K TV, users can now enjoy videos and movies with staggering vivid details from the comfort of your sofa. It is really cool to watch and play 4K videos on Samsung best 4K TVs. But...things are not satisfying all the time. In case you may get the 4K video from your Sony, Panasonic, Canon, Nikon or Samsung camcorder formatted with MTS, MXF, XAVC, MP4, MOV, H.265, etc., sorry to tell you though Samsung 4K TV accepts the 4K Ultra HD resolution, it still can't work with some camcorder video formats, for which are excluded from the Samsung 4K TV compatible format list. Please bear in mind USB/External drive on Samsung 4K TV can carry films, documentaries and showreels in the HEVC H.265 format at frame rates up to 60fps. 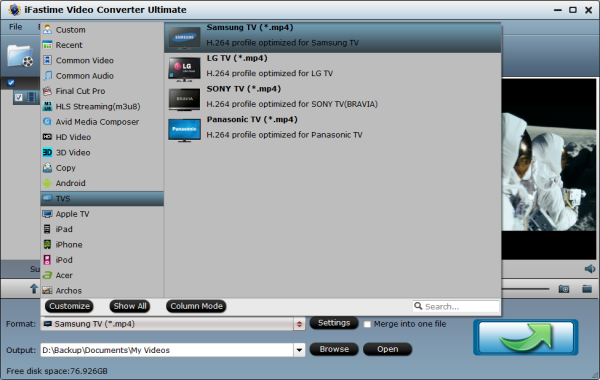 If you are going to enjoy 4K content in other formats on Samsung 4K TV from USB, please turn to a 4K TV video converter for help. 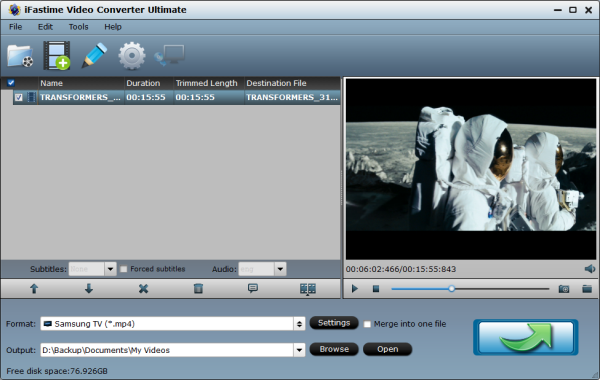 Here iFastime Video Converter Ultimate is highly recommended, which is able transcode 4K videos in any formats including MTS, MXF, XAVC, MP4, MOV, H.265, MKV, FLV, WMV, etc. to Samsung 4K TV, Sony/LG/Panasonic 4K TVs recognizable formats with no hiccurp. Moreover, this 4K video converter also performs great as a 4K video compressor to compress 4K to 1080P/720P with even smaller file size or unwanted video clips removal. if you wish. Unlike other simliar products which may convert the audio a few frames behind the video no matter what settings you use, this 4K video handling tool works excellent and converts seamlessly. Clean, no plug-in, no ads. If you want to change the 4K file format to Samsung 4K TV on Mac, please turn to iFastime Video Converter Ultimate for Mac to solve all the problems. 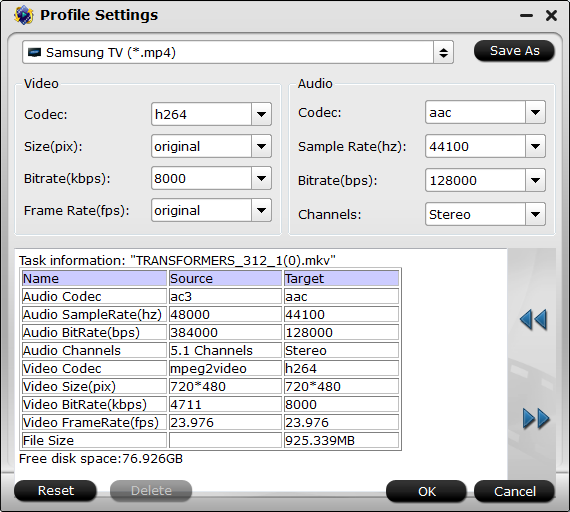 Before start the 4K video conversion for Samsung 4K TV, you can click the Settings icon and adjust the video size, video bitrate, codec, frame rate, audio sample rate, etc parameters. You can keep video size as original if you need high quality on 4K TV meanwhile have a storage device with large occupation. Or down-convert ultra HD 4K to 1080p for playing 4K on Samsung 4K TV smoothly, do remember adjusting video size to 1920*1080. Click the "Start conversion" button to start and finish the 4K MTS/MXF/XAVC/MP4/MOV/H.265 to Samsung TV video format conversion. When the conversion is done, 4K movies and TV shows are no different from other compatible local video files. You can head to the destination folder where the converted files are stored and transfer them to USB Flash Drive or External Hard Drive to play on Samsung 4K TV now! Or you can use Samsung AllShare to easily sharing your media content to plenty of other compatible devices. 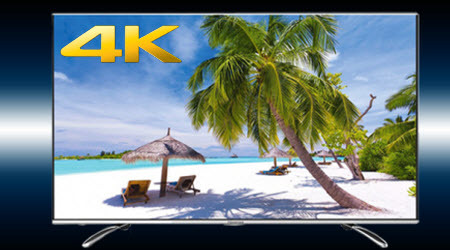 With the aid of the smashing 4K video converter, you can play 4K Ultra HD video (MTS/MXF/XAVC/MP4/MOV/H.265) on Samsung 4K TV with less occupation regardless of video formats or codec. Just have a try! Where to find 4K video resources? In fact, in addition to recordings from 4K cameras, 4K has made its way to plenty of 4K content provides, like YouTube, Netflix, Samsung UHD Video Pack service, Amazon Instant Video, NanoTech Entertainment, Sony Video Unlimited 4K Service, M-GO, Comcast, etc. You can choose a nice place and download your favorite 4K UHD video for playback on Samsung 4K TV. 1. 4K Video Downloader - Download online videos without snags or compromises. * Supporting many popular sites like YouTube, Dilaymotion and Metacafe. 2. Video Grabber- Download your favorite 4K videos from YouTube. * This software is capable of automatically detecting the video, after which a Download button appears in your browser. When compared to some of its competitors in the market the downloading speed appears to be a little slower. 3. Tmib Video Downloader Save YouTube videos in 4K or 3D. * Free download 3D videos. * Cannot convert the downloaded files into other formats after downloading. But make sure the video format is accepted before you download and play 4K UHD video on Samsung 4K TV. Otherwise, convert them using the above method.